Searching for Bonobo in Congo » Why the Lomami River? « Who Is Ashley Vosper and Where Is He Going? Why take a dug-out 650 kilometers through DR Congo’s forest emptiness? Those four tiny openings we see on the satellite image might not even be villages. 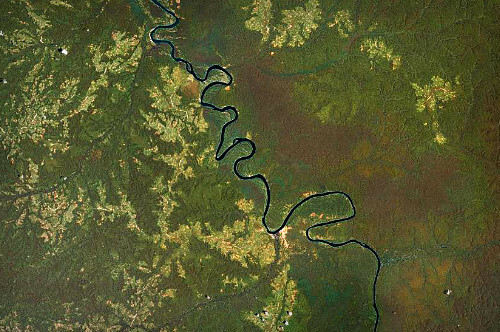 All those endless river meanders between the town of Opala and the southern savanna with nothing to look at but the same equatorial snapshot : dark trees draped in lianas, why do it? I could say Ashley, the leader, is pushing off for adventure. I could say the appeal is that huge blank (about 60,000 km2) on the map. All true enough, and I could leave it at that. But it is not the whole picture. Far from it. The rest of the picture: forest conservation. And it is urgent. The truth is governments only protect places they know about, because conservation costs money, lots of money. In Africa, the big conservation organizations have their priorities. Those priority places were explored long ago, they are places with relatively easy access, easy research, easy infrastructure. There is information. How many large mammals are there? You can read about it in articles. How many birds, how many hills, and what you can see from the tops of those hills: it is known. Not so the Lomami. In their priority areas, the big conservation organizations can justify saving special monkeys, and endemic salamanders and certain important mineral licks for elephants. Not so the Lomami. There is no information. In this information age there are still information holes where, although the satellites beam down, nothing beams up – no correlated reference – no pictures, no recorded sounds, no list of animals or plants, no census even of human presence. All that we know about the Lomami is that south, below Kisangani and below Opala, the satellite gives back a nearly unbroken roof of forest leaves. Beneath those leafy shingles are bonobo –a great ape that is not a chimpanzee but as much our cousin as any chimp. There are also okapi, a giraffe the size of a horse that eats only forest leaves and lives a solitary, secretive existence. We know this because of the bushmeat that arrives far north in the outdoor food markets of Kisangani; that is not the same as knowing where the okapi and the bonobo occur on the ground, how many there are and what other monkeys, antelope, snakes, birds also occur in these forests. So Ashley’s mission is a first step into the unknown. 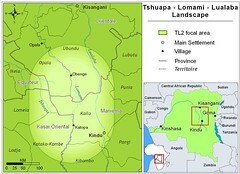 His initiative will orient a second step: forest teams counting and recording animal sign they will spread across the whole 60,000 km2 forest expanse on either side of the Lomami, west into the Tshuapa river basin and east up to the Lualaba River. These two steps will give the understanding needed to build support for a national park. Because north of Kisangani the first roads are being re-opened and surfaced. Big money is moving down those roads. The long ten-year Congo wars are over, and the 30 years of Congo corruption are promising to give way to investment that will transform forests with logging, with mining and with trade. We can fight to protect a park, but not 60,000 km2 of unknown, un-inhabited wilderness that reflects on the distant lens of a satellite as a carpet of leaves, with only a raveling of rivers breaking through. This entry was written by Terese Hart, posted on 2007-05-21 at 9:59 pm, filed under About the project. Bookmark the permalink. Follow any comments here with the RSS feed for this post. Post a comment or leave a trackback: Trackback URL.